+ 1. With a relatively high increase in blood flow taking place in such a short amount of time, what physiological changes ensue during use of a PEMF type device? PEMF therapy accelerates vaso-dilation, through Vaso-motor stimulation of the smooth muscle walls of the arterial system. PEMF therapy also creates a percussive muscular contraction that can penetrate completely through all muscle tissue in th targeted boy part. Through these two physiological responses the PEMF causes the targeted area's vascular system to instantly expand the diameter of arteries and capillaries, combined with percussive muscular contractions acting as a "pump", causing more blood flowing to and through the area being treated, which is critical to accelerating the healing process. Around inflamed areas, vaso-dilation will help dissipate excessive build up of blood and body fluid, thus reducing swelling and inflammation. Vaso-dilation quickly enables many other of the body’s healing mechanisms. Additionally, the scarring and trauma to muscles, connective tissues, sinew and cartilage start to break up. This provides the relief most users experience after one or two treatments on an affected area. +2. Are there any contra-indications to be aware of when using a PEMF device? Yes! If a patient is pregnant, has any implanted electronic devices, such as a pacemaker, or are going into surgery within 36 hours of a PEMF treatment, the patient should not subject themselves to PEMF. People receiving PEMF treatments on recent surgeries should avoid higher levels of pulse intensity. Other contra-indications preclude patients who are on chemotherapy or blood thinners. Patients who have had hips or knees replaced with fabricated metal parts may be safely treated. +3. Is there any scientific research on high-powered PEMF devices? There is little scientific research because MP/MF PEMF devices are a relatively new category of PEMF technology. However, there are thousands of university level case studies for the use of PEMF on hundreds of indications, from arthritis to edema to neuropathy. We encourage you to review the studies published in this pamphlet A search online at www.PubMed.gov for, say, “PEMF and Arthritis” will yield medical abstracts indicating many case studies and treatments using low powered devices for hundreds of hours. I.E. 8 hours a day, 5 days a week, for 6 weeks. Alternately, MP/MF PEMF devices perform the same physiological function, but in a fraction of the time because of higher gauss levels and deeper penetration. As more MP/MF PEMF devices are utilized in the medical community, expect more scientific research to appear. +4. How often should a body part be treated to achieve long term results? There is no set treatment protocol for anyone or any one issue. Long-term chronic pain may require a dozen or more treatments, spread out over an extended time period. PEMF will almost always accelerate healing, however the rate of acceleration is generally related to the severity and extent of the injury. In many cases pain relief and/or increased range of motion is immediate, however these issues may return in 24 hours, in 2 days, or in 2 weeks. I.E. Pain relief from tendonitis may occur after one treatment, but returning to the activity which aggravated the condition in the first place, then more than likely, the condition or pain will quickly return. +5. How does a PEMF device be used in the treatment of, for instance, a dislocated joint or a herniated disc? +6. Why MP/MF (Multi-Powered / Multi-Frequency) PEMF? Home Page : http://drveronica.com/ Dr. Veronica Anderson, Host, Medical Intuitive, Homeopath, Functional Medicine and an NES Health Bio Energetic Practitioner interviews Dr. William Pawluk on how to rebuild your body through pulsed electromagnetic field therapy. Dr. William Pawluk is a former family physician who transitioned to holistic medicine and treatments. Click here to find out about MP/MF PEMF! Copyright 2018 Magnus Magnetica, LLC / Unauthorized use or duplication is prohibited by law. Inflammation is a cascade of physiologic processes instigated by the body to repair cellular damage in tissues with good blood supply and to restore the tissue to its normal function. Normal cells are not usually impacted by magnetic fields. Compromised cells, called meta-stable cells, are more likely to be impacted. This means that PEMFs have more impact in circumstances where there is imbalance in tissues or cells, ie, where there is pathology or chronic inflammation. Where homeostasis in the body is robust, PEMFs, especially weaker PEMFs, are unlikely to have effects. For example, activation of the T cell receptor, such as happens with PEMFs, also activates various processes in the cell that within five minutes after removing the activating signal, these activated processes return to normal levels. PEMF’s inhibit growth and the natural death of unwanted lymphocytes that decreases inflammation. The PEMF inhibition of lymphocytes and then inflammatory processes appears to be most obvious 48 and 72 hours after EMF treatment and then the EMF effect seems to disappear. This indicates that the effects of PEMFs can work well with other natural treatments. PEMF use for inflammation needs to be optimized so that exposure will lead to long-lasting, therapeutically relevant outcomes. Pulse-burst-modulated higher frequency fields seem to be much more effective than other frequency signals, and therefore produce improved therapeutic outcomes. While particular types of signals may be most effective, a positive response is often seen to various kinds of magnetic stimuli. There appear to be similar effects on lymphocytes using pulsed bone healing fields, versus sinusoidal power line frequency fields. PEMF therapy specifically targets cells that are meta-stable as a consequence of disease or other ongoing therapies. Thus, PEMF’s can be an important cellular therapy in many diseases, including cancer, psoriasis, wound healing, and bacterial infections because of their effects on reducing chronic inflammation. It is important that normal homeostatically stable cells are not harmed by PEMF’s, allowing other treatments to be more effective without proportional increases in side effects. In chronic inflammatory diseases, cells are characteristically maintained in meta-stable states, as a consequence of cytokine secretions and other stressors associated with the disease. In these cases, PEMF’s can work as a stand-alone anti-inflammatory therapy. Even weak, low-frequency PEMF’s induce apoptosis in activated T cells, thereby reducing chronic inflammation without negatively affecting acute inflammation. A cap-like device that fights brain tumors using electric fields has been found to improve survival rates for cancer patients to such an extent that it is “impossible to ignore,” according to a new study. Results of the study showed more than twice as many patients were alive five years after receiving the tumor-treating fields (TTFields) treatment, along with chemotherapy, than those who were given just chemo. "It's out of the box" in terms of how cancer is usually treated, and many doctors are skeptical of the therapy. It also comes with a price tag of $21,000 per month, according to Dr. Roger Stupp, a brain tumor expert at Northwestern University in Chicago, as cited by Medical Express. "Patients like it. Doctors have more of a problem. They think it's weird," Dr Stupp told Medscape. Stupp led the study, which involved about 80 centers worldwide and 695 patients, while at University Hospital Zurich in Switzerland, and presented the results Sunday at the American Association for Cancer Research meeting in Washington. The study was aimed at improving survival in glioblastoma, the most aggressive and malignant primary brain tumor in adults. It required patients to wear the device for at least 18 hours a day while going about their usual routine “Our results demonstrate a proof-of-concept that this treatment modality actually works, and can prevent tumor cells from growing and dividing," Stupp told HealthDay. While the device, named Optune, does not cure the cancer, patients who availed of the treatment experienced a 43 percent survival rate in the first two years, in comparison to 31 percent for standard chemotherapy treatments. "The device is now impossible to ignore... it absolutely is an advance," said Dr. Andrew Lassman, brain tumor chief at the Columbia University Medical Center/New York-Presbyterian Hospital. Minimal side effects include blood-count problems, weakness, fatigue and skin irritation from the electric fields. Optune is sold in the US, Germany, Switzerland and Japan and is currently undergoing testing for pancreatic, ovarian and lung cancers, where the electrodes would be worn across the chest or stomach. The main hurdle for the Optune to overcome is its affordability, at a cost of around $700 per day and while most US insurers cover the fee, Medicaid does not.The price reflects an “extremely sophisticated medical device, made in very low quantities,” said Bill Doyle, the chief executive of Novocure, who make the device. Dr. Pawluk: "I have never been a proponent of saying that PEMFs alone should be used to treat cancer. The most humbling thing I can say about the treatment of cancer is that there are no perfect solutions. I would also say there is no such thing as a cure." How can we make the results of medical therapies more certain and more predictable? PEMF therapies may be one approach to enhancing the value of existing therapies. The research available to support the use of PEMFs in the setting of cancer is still far from being of great certainty. Of course, the same can be said of most existing medical therapies. So, the question is what is the harm? The harm comes largely from uncertainty. Conventional medical therapies still have a huge level of uncertainty as well, but they are sanctioned by society and the medical community. That makes them acceptable, even though they are very often ineffective. Because PEMFs are not as acceptable, and because the science is not compelling, to convince most doctors or most guideline and professional bodies, they are considered to be “unacceptable”. That being said, most doctors are completely ignorant about what PEMFs do biologically and physically. And, unfortunately, they are not even willing to explore these approaches. Likewise, most doctors are not even willing to approach and consider nutritional aspects of managing cancer. As a result, the consumer and the person suffering from cancer, is largely left on his/her own. Cancer is one of the most common causes of death worldwide. Available treatments are associated with numerous side effects and only a low percentage of patients achieve complete remission. Therefore, there is a strong need for new therapeutic strategies. In this regard, pulsed electromagnetic field (PEMF) therapy presents several potential advantages including non‐invasiveness, safety, lack of toxicity for non‐cancerous cells, and the possibility of being combined with other available therapies. Indeed, PEMF stimulation has already been used in the context of various cancer types including skin, breast, prostate, hepatocellular, lung, ovarian, pancreatic, bladder, thyroid, and colon cancer in vitro and in vivo. At present, only limited application of PEMF in cancer has been documented in humans. In this article, we review the experimental and clinical evidence of PEMF therapy discussing future perspectives in its use in oncology. R. Sandyk, “Alzheimer’s Disease: Improvement of Visual Memory and Visuoconstructive Performance Treatment with Picotesla Range Magnetic Fields,” International Journal of Neurosci, 76(3-4), June 1994, p. 185-225. As generally supported, a persons biological daily clock may causally be related to memory deterioration in Alzheimer’s patients and in the ageing. Synchronizing of the circadian rhythms using magnetic fields, (this article suggests) could lead to improved memory for those affected. R. Sandyk, et al., “Age-related Disruption of Circadian Rhythms: Possible Relationship to Memory Impairment and Implications for Therapy with Magnetic Fields,” International Journal of Neurosci, 59(4), August 1991, p. 259-262. A. Bellosi & R. Berget, “Pulsed Magnetic Fields: A Glimmer of Hope for Patients Suffering from Amyotrophic Lateral Sclerosis,” Second World Congress for Electricity and Magnetism in Biology and Medicine, 8-13 June 1997, Bologna, Italy. A.A. Pilla & L. Kloth, “Effect of Pulsed Radio Frequency Therapy on Edema in Ankle Sprains: A Multisite Double-Blind Clinical Study,” Second World Congress for Electricity and Magnetism in Biology and Medicine, 8-13 June 1997, Bologna, Italy, p. 300. The high level of efficacy from use of our MP/MF PEMF technology is created when the unique percussive muscular contraction, which causes the mechanical break up of intramuscular adhesion, intersects with high increases in blood flow and an accelerated reduction of inflammation (in the locally treated area). Adhesion occurs in connective tissue for a wide variety of factors, situations and circumstances including age, posture, injuries, surgeries, repetitive activities/strains and living life in general. Thus, we think it crucial to the reader to have a better understanding of how fascia, tendons and adhesion profoundly affect a human's or animal's experience through movement. Fascia is a form of connective tissue. Its jobs are to provide a sliding and gliding environment for muscles, suspend organs in their proper places, transmit movement from muscle to the bones they are attached to, and provide a supportive and a moveable wrapping for nerves and blood vessels as they pass through and between muscles. Fascia, in its non-stretchy form, is the substance that makes up tendons, which attach muscle to bone, and ligaments, which attach bone to bone. Fascia is like a big cobweb that runs throughout your entire body. The interconnected nature of fascia means that everything in the body is connected to everything else. When one part of fascia is injured or compromised in any way, it can affect tissues that arefar from the original site of the injury or impairment. In the case of repetitive strain injuries, this means that tissue changes in the shoulder which are the result of an old injury can, over time, affect the condition and function of fascia farther down the arm and into the hand. This often leads to the confusing, seemingly unrelated symptoms that are often present in any case of RSI. Symptoms may be felt in one area, but the source of the strain may be located somewhere else. In the case of repetitive strain injuries that have muscle-based symptoms (weakness, pain, pressure, drawing sensations, congestion, etc. ), the fascia surrounding and permeating through muscle becomes tight and restricted. This can prevent the muscle from accomplishing the work it is designed to do by inhibiting the full contraction and release of the tight muscle. This forces neighboring muscles to pick up the slack, helping the restricted muscle do its job. The problem is, the helper muscles aren’t designed to contract and release in exactly the same direction as the restricted muscle, so the assistancecauses more strain in the helper muscle. Thus, both muscle groups, primary and secondary, become restricted and strained and the process of creation of adhesion and more restriction continues. Fascia creates a wrapping around the entire muscle, much like a sausage casing. This part of the fascia can also become adhered and will cause one muscle to stick to its neighbor. When one muscle contracts, it must drag along the muscle that is stuck to it, causing strain. Fascia tightens in the area to help protect the strained muscles, and more adhesions develop as a result. The moldability of fascia is the reason that ergonomics is so important when recovering from a repetitive strain injury. If a person habitually sits in a slouched posture, then over time the fascia in a person’s body will mold itself to that posture. Fascia in the chest will pull the ribcage down, fascia in the neck will pull the head and neck forward, the slouched position of the upper torso will change how the arm bones fit in the shoulder joints and the fascia in the shoulder area will change as a result. All of these posture-related tissue changes will be felt by the body as a source of strain. Now, add a repetitive motion using muscles in that area and you have the perfect environment for creating a repetitive strain injury. The plantar fascia is a ligament band running from your heel to the ball of your foot. This band pulls on the heel bone, raising the arch of your foot as it pushes off the ground. But if your foot moves incorrectly, the plantar fascia may become strained. The fascia may swell and its tiny fibers may begin to fray, causing plantar fasciitis. A heel spur is a bony outgrowth at the base of the heel bone near the plantar fascia. A spur may cause pain on the bottom of the heel when you stand. As with plantar fasciitis, the pain may decrease after standing or walking a short time. The pain you feel is not from the spur itself. Your heel hurts because the spur pinches a nerve or presses against the plantar bursa. With a bursitis (inflamed bursa) it may apply pressure to the plantar fascia. Many cells in the body produce nitric oxide; however, its production by the vascular endothelium is particularly important in the regulation of blood flow. Abnormal production of nitric oxide, as occurs in different disease states, can adversely affect blood flow and other vascular functions. Nitric oxide is one of the few gaseous signalling molecules known and is additionally exceptional due to the fact that it is a radical gas. It is a key vertebrate biological messenger, playing a role in biological processes. The March/April 2009 Aesthetic Surgery Journal published a study: “Evidence-Based Use of Pulsed Electromagnetic Field Therapy in Clinical Plastic Surgery” that summarizes the evolution in the understanding of the physiological effects of PEMF therapy on cells and tissues. Studies emerged suggesting that PEMF could modulate the production of growth factors and began to focus on enzyme systems with well-characterized calcium (Ca2+) dependence. By the mid-1990's, researchers were investigating the effects of electrical and PEMF signalling on intracellular Ca2+, specifically the binding of Ca2+ to calmodulin (CaM), using the knowledge that CaM dependent cascades were involved in tissue repair. The most recent studies of the PEMF transduction pathway have concentrated upon the Ca/CaM-dependent nitric oxide cascades, the growth factor cascades involved in tissue healing. It is within this system that the effectiveness of PEMF is now understood to function. PEMFs modulate the calcium-binding kinetics to calmodulin. Calcium/calmodulin (Ca/CaM) then activates nitric oxide synthase (NOS) in several different isoforms. When injury occurs, large amounts of nitric oxide are produced by long-lived inducible nitric oxide synthase (iNOS). In this cascade, tissue levels of nitric oxide persist and the prolonged presence of this free radical is pro-inflammatory, which accounts for the leaky blood vessels associated with pain and swelling. In contrast, the endothelial and neuronal nitric oxide synthase isoforms (respectively eNOS and nNOS) produce nitric oxide in short bursts that can immediately relax blood and lymph vessels. These short bursts of nitric oxide also lead to the production of cyclic guanosine monophosphate (cGMP), which in turn drives growth factor production. Interestingly, iNOS is not dependent on CaM, while the constitutive or cNOS (eNOS or nNOS) cascade is dependent on the binding of Ca/CaM. Therapies that could accelerate Ca/CaM binding, therefore, should impact all phases of tissue repair, from initial pain and swelling to blood vessel growth, tissue regeneration, and remodeling. As shown in the diagram to the left, this mechanism has been proposed as a working model for PEMF therapeutics. Nitric oxide, known as the 'endothelium-derived relaxing factor', or 'EDRF', is bio-synthesized endogenously from L-arginine, oxygen and NADPH by various nitric oxide synthase (NOS) enzymes. Dr. Richard E. Klabunde explains the synthesis of nitric oxide from the amino acid L-arginine by the enzymatic action of nitric oxide synthase (NOS). There are two endothelial forms of NOS: constitutive NOS (cNOS; type III) and inducible NOS (iNOS; type II). In addition to endothelial NOS, there is a neural NOS (nNOS; type I) that serves as a transmitter in the brain and in different nerves of the peripheral nervous system, such as non-adrenergic, non-cholinergic (NANC) autonomic nerves that innervate penile erectile tissues and other specialized tissues in the body to produce vasodilation. The endothelium (inner lining) of blood vessels uses nitric oxide to signal the surrounding smooth muscle to relax, thus resulting in vasodilation and increasing blood flow. Under normal conditions, nitric oxide is continually being produced by cNOS in the blood vessels. The activity of cNOS is Ca/CaM-dependent and produces vascular relaxation when the endothelium is intact. The activation of the other isoform of endothelial NOS is iNOS is not calcium dependent. Under normal conditions, the activity of iNOS is very low. The activity of iNOS is stimulated during inflammation by bacterial endotoxins or cytokines such as tumor necrosis factor (TNF) and interleukins. During inflammation, the amount of nitric oxide produced by iNOS may be a 1,000-fold greater than that produced by cNOS. Copyright 2016 Magnus Magnetica, LLC / Unauthorized use or duplication is prohibited by law. When nitric oxide forms, it is highly reactive (having a lifetime of a few seconds), yet diffuses freely across membranes, primarily because superoxide anion has a high affinity for nitric oxide. Superoxide and its products can have vasoactive activities in addition to their tissue damaging effects; superoxide anion has another property that makes it very important in cardiovascular pathology and pathophysiology. Superoxide anion, with its unpaired electron, very rapidly binds to nitric oxide, which also has an unpaired electron. Because nitric oxide is a very important vasodilator substance, the reaction between superoxide and nitric oxide effectively scavenges nitric oxide thereby reducing its bioavailability. This leads to vasoconstriction, increased platelet-endothelial cell adhesion, platelet aggregation and thrombus formation, increased leukocyteendothelial cell adhesion, and morphologic changes in blood vessels, such as cell proliferation. Nitric oxide also avidly binds to hemoglobin (in red blood cells) and the enzyme guanylyl cyclase, which is found in vascular smooth muscle cells and most other cells of the body. When nitric oxide is formed by vascular endothelium, it rapidly diffuses into the blood where it binds to hemoglobin and is subsequently broken down. It also diffuses into the vascular smooth muscle cells adjacent to the endothelium where it binds to and activates guanylyl cyclase. This enzyme catalyzes the 16 dephosphorylation of GTP to cGMP, which serves as a second messenger for many important cellular functions, particularly for signalling smooth muscle relaxation. Direct vasodilation (flow dependent and receptor mediated) Indirect vasodilation by inhibiting vasoconstrictor influences Anti-thrombotic effect - inhibits platelet adhesion to the vascular endothelium Anti-inflammatory effect - inhibits leukocyte adhesion to vascular endothelium; scavenges superoxide anion Anti-proliferative effect - inhibits smooth muscle hyperplasia. By increasing the production of nitric oxide when its production is impaired or its bioavailability is reduced, PEMF therapy can successfully help improve conditions and diseases, including those associated with vasoconstriction (e.g., coronary vasospasm, elevated systemic vascular resistance, hypertension), thrombosis due to platelet aggregation and adhesion to vascular endothelium, inflammation due to upregulation of leukocyte and endothelial adhesion molecules, vascular hypertrophy and stenosis, and consequently hypertension, obesity, dyslipidemias (particularly hypercholesterolemia and hypertriglyceridemia), diabetes (both type I and II), heart failure, atherosclerosis, tissue repair and aging. A recent study on postoperative recovery led to the conclusion that PEMF therapy significantly reduced postoperative pain and narcotic use in the immediate postoperative period by means of a PEMF effect on nitric oxide signaling, which could impact the speed and quality of wound repair (Rohde et al., June 2009, Plastic & Reconstructive Surgery, Columbia, NY). Nitric oxide is one of the few gaseous signaling molecules and a key vertebrate biological messenger that plays a role in a variety of biological processes. Recent studies 17 uncover how PEMF therapy stimulates and rebalances many of these processes. The mechanisms by which nitric oxide has been demonstrated to affect the biology of living cells are numerous and include oxidation of iron-containing proteins such as ribonucleotide reductase and aconitase, activation of the soluble guanylate cyclase, a single transmembrane protein, ADP (adenosine di-phosphate) ribosylation of proteins, a process of protein modification involved in cell signaling and the control of many cell processes including DNA repair, protein sulfhydryl group nitrosylation, another protein modification process, and iron regulatory factor activation. Having a lifetime of a few seconds, nitric oxide is highly reactive and diffuses freely across cell membranes. These attributes make nitric oxide an ideal transient paracrine (between adjacent cells) and autocrine (within a single cell) signaling molecule. PEMF therapy is proven to effectively stimulate paracrine and autocrine communication. Nitric oxide is also generated by phagocytes (monocytes, macrophages, and neutrophils) and, as such, is part of the human immune response. Nitric oxide has been demonstrated to activate NFb B in peripheral blood mononuclear cells, an important protein complex that controls the transcription of DNA and a transcription factor in iNOS gene expression in response to inflammation. mechanically stimulates the lymphatic vessels and waste products are hauled away from the cells more efficiently. PEMF therapy supports immune health by mechanically stimulating lymphatic drainage and blood flow. In June 2004, The Faseb Journal states: PEMF therapy has been shown to be clinically beneficial in repairing bones and other tissues, but the mechanism in action is unclear. The results of a study done at the New York University Medical Center (Institute of Reconstructive Plastic Surgery, NY, NY, USA) demonstrates that electromagnetic fields increased angiogenesis, the growth of new blood vessels, in vitro and in vivo through the endothelial release of FGF-2, fibroblast growth factor-2. The delivery of PEMF therapy in low doses identical to that currently in clinical use significantly increased endothelial cell proliferation and tubulization, which are both important processes for vessel formation. The ability of PEMF to increase cell proliferation was unique to endothelial cells, which seemed to be the primary target of PEMF stimulation, releasing a protein in a paracrine fashion (or signalling to adjacent cells and other types of cells) to induce changes in neighbouring cells and tissues. Since direct stimulation did not produce significant changes in osteoblast proliferation, the ability of PEMF therapy to enhance the healing of complicated fractures is likely the result of increased vascularity rather than a direct effect on osteogenesis as previously believed. The coordinated release of FGF-2 suggests that PEMF therapy may facilitate healing by augmenting the interaction between osteogenesis and blood vessel growth. As such, PEMF therapy may offer distinct advantages as a non-invasive and targeted modality that is able to release several growth factors to achieve therapeutic angiogenesis. The fibroblast and endothelial cells are made to go embryonic due to drastic changes in ionic concentrations in the cells’ cytoplasm and therefore the cells’ nuclei. These ionic concentrations react with the cell DNA opening up some gene sets and closing down others. It is apparently the rapid onset of a strong-pulsed electric field generated by the pulsed magnetic field, which causes some cell ion gate types to open and be force fed ions by the same electric field. As demonstrated in the following study entitled: “Impulse magnetic-field therapy for erectile dysfunction: a double-blind, placebo-controlled study”, increased microcirculation leads to improvements in macro-circulation. The 19 study by Pelka et al. (Universitat der Bundeswehr Munchen, Munich, Germany) assessed the efficacy of three weeks of PEMF therapy for erectile dysfunction. In the activetreatment group, all efficacy endpoints were significantly improved at study end with 80% reporting increases in intensity and duration of erection, frequency of genital warmth, and general well-being. In contrast, only 30% of the placebo group noted some improvement in their sexual activity; 70% had no change. No side effects were reported. PEMF therapy has proven efficacious at increasing the flow of ions and nutrients into the cells and at stimulating blood and interstitial fluid circulation. With increased lymphatic drainage and blood flow, cells receive more oxygen and nutrients, and eliminate toxins faster. Cells are therefore able to function better and tissues repair themselves more efficiently. Through the same processes, vital organs such as the liver, kidneys and colon are able to rid themselves of impurities thus detoxifying the body and allowing better organ functionality. As early as 1940, it was suggested that magnetic fields affect the TMP and the flow of ions in and out of the cells and might therefore influence cellular membrane permeability. 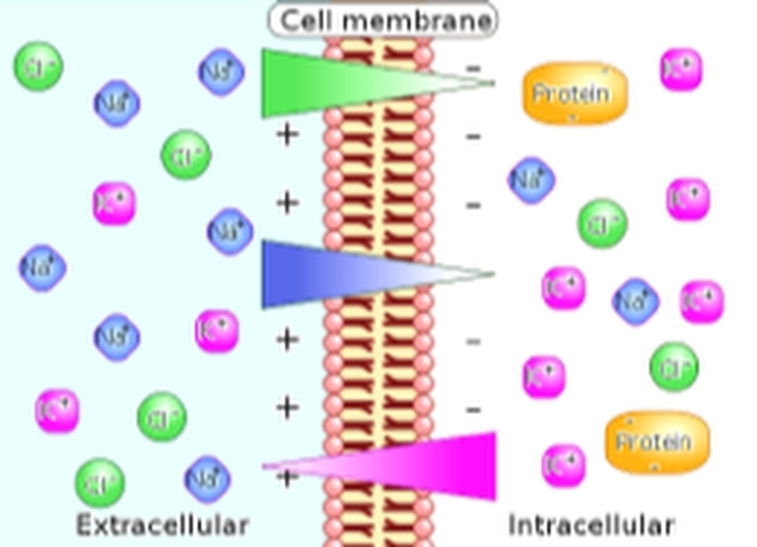 It has since been established that magnetic fields can influence ATP (Adenosine Tri-phosphate) production; increase the supply of oxygen and nutrients via the vascular and lymphatic systems; improve the removal of waste via the lymphatic system; and help re-balance the distribution of ions across the cell membrane. Healthy cells in tissue have a voltage difference between the inner and outer membrane referred to as the membrane resting potential that ranges from -70 to -80 mV. This causes a steady flow of ions through its voltage-dependant ion channels. In a damaged cell, the potential is raised and an increased sodium inflow occurs. As a result, interstitial fluid is attracted to the inner cellular space, resulting in swelling and edema. The application of PEMF to damaged cells accelerates the re-establishment of normal potentials (Sanseverino, 1999) increasing the rate of healing and reducing swelling. In biology, depolarization is a change in a cell's TMP, making it more positive or less negative. In neurons and some other cells, a large enough depolarization may result in an action potential. Hyper polarization is the opposite of depolarization, and inhibits the rise of an action potential. If a cell has a resting potential of -70mV and the membrane potential rises to -50mV, then the cell has been depolarized. Depolarization is often caused by influx of cations, e.g. Na+ through Na+ channels, or Ca2+ through Ca2+ channels. On the other hand, efflux of K+ through K+ channels inhibits depolarization, as does influx of Cl (an anion) through Cl channels. If a cell has K+ or Cl currents at rest, then inhibition of those currents will also result in a depolarization. As the magnetic field created fluctuates, it induces an electron flow or a current in one direction through the living tissue. As electrons always flow from a negative (cathode) to a positive (anode) potential, when the magnetic field vanishes, the direction of the electron flow is reversed. Therefore such induced polarized currents stimulate the exchange of ions across the cell membrane. As the electro-magnetic field pulses temporarily hyperpolarize and depolarize the membrane, the ion channels open and close allowing a more efficient ion exchange, as with the sodium-potassium (Na+, K+) pump, thus increasing cellular oxygenation and nutrition as sodium export stimulates several secondary active transporters. A study entitled “Modulation of collagen production in cultured fibroblasts by a low-frequency pulsed magnetic field” by Murray et al. (Biochim Biophys Acta) shows that the total protein synthesis was increased in confluent cells treated with a pulsed magnetic field for the last 24 h of culture as well as in cells treated for a total of 6 days. However, in 6 day-treated cultures, collagen accumulation was specifically enhanced as compared to total protein, whereas after short-term exposure, collagen production was increased only to the same extent as total protein. These results indicate that a pulsed magnetic field can specifically increase collagen production, the major differentiated function of fibroblasts, possibly by altering cyclic-AMP metabolism. PEMF therapy successfully increases membrane flexibility by increasing the synthesis of collagen, a crucial protein that supports membrane elasticity, within the fibroblasts. In doing so, PEMF therapy increases tissue and muscle flexibility thereby expanding the user’s range of motion. DNA synthesis is linked to pulsed, low intensity magnetic fields (Liboff et al., 1984; Rosch et al., 2004). Proteins are conductors of electricity. When exposed to strong fields, proteins are subject to electrophoresis. The Ribonucleic Acid (“RNA”) messengers that are synthesized from a Deoxyribonucleic Acid (“DNA”) template during transcription mediate the transfer of genetic information from the cell nucleus to ribosomes in the cytoplasm and serve as a template for protein synthesis. Since RNA mechanically influences the DNA and encoded proteins influence RNA, the flow of information to and from genes may be linked to changing magnetic fields (Einstein, 1977; Goodman et al., 1983). Since magnetic fields interact with changing electrical charges and recent studies (Dandliker et al., 1997) show that DNA conducts electrons along the stacked bases within the DNA double helix, electro-magnetic fields may initiate transcription of the precursor mRNA by accelerating electrons moving within the DNA helix (McLean et al., 2003). The many intra and inter cellular processes and activity stimulated by PEMF therapy lead to faster cellular and tissue regeneration. This fact is shown by the results of many studies on a variety of tissues, including bones, spine, cartilage, intestines, blood vessels, nerves, brain, and muscles. Several factors may contribute to inflammation including injury, tissue damage, a poor localized circulation with the formation of edema. Inflammation causes pain. Swelling and bruising is an inflammation and discoloration of soft tissue caused by an impact injury or trauma. It can also result from surgery. Tissue cells are inherently like tiny electrically charged machines. When a cell is traumatized, the cell’s electrical charge is diminished; this causes normal cell functions and operations to shut down. Cells that are scarred or fibrotic with adhesions have a TMP charge of approximately -15 mV, degenerative or immune-compromised cells average -30 mV, both low TMPs. With the raised TMP, the body releases chemical signals that cause inflammation swelling and bruising resulting in pain and inhibiting the cell communication pathways necessary for healing to begin. Numerous clinical studies have demonstrated that PEMF therapy has been successful in reducing inflammation. PEMF therapy treats the cellular source of swelling by recharging the cells with a mild electromagnetic current. This stops the release of pain and inflammatory mediators, reduces inflammatory fluids and allows an increase in blood flow, therefore increased oxygen intake, to help the cells heal faster with less swelling, pain and bruising. The effect of wound healing electromagnetic fields on inflammatory cytokine gene expression in rats was studied by Jasti et al. in 2001 whostate: “Inflammation is characterized by massive infiltration of T lymphocytes, neutrophils and macrophages into the damaged tissue. These inflammatory cells produce a variety of cytokines, which are the cellular regulators of inflammation”. In a study on Low Frequency PEMF, a viable alternative therapy for arthritis published in 2009, Ganesan et al. (Department of Biotechnology, Chennai, India) declare: “PEMF for arthritis cure has conclusively shown that PEMF not only alleviates the pain in the arthritis condition but it also affords chondroprotection, exerts anti-inflammatory action and helps in bone remodeling, and this could be developed as a viable alternative for arthritis therapy”. Damaged cells are also energy deficient; thus they have low oxygen levels, high in sodium levels, and have a faltered electrochemical gradient. By inducing a mild electrical current into damaged cells, PEMF therapy slows or stops the release of pain and inflammatory mediators, increases blood flow, and re-establishes normal cell interaction. PEMF stimulates and restores the electrochemical gradient, the cell starts pumping sodium out, potassium enters the cell, the swelling resolves, oxygen starts flowing back in, and pain improves. Due to the density of the cell tissue, change requires stronger pulsed magnetic fields to be able to restore the healthy TMP to its optimal -70 mV. Several factors influence tissue inflammation and the processes by which PEMF therapy operates to reduce inflammation include complex mechanical, chemical, electrical and magnetic processes along with increased circulation, oxygenation and cellular activity. With reduced inflammation, pain decreases and faster tissue healing occurs. Effects of pulsed electromagnetic fields on articular hyaline cartilage: review of experimental and clinical studies by M. Fini. G. Giavaresi, A. Carpi, A. Nicolini, S. Setti, R. Giardino (Experimental Surgery Department, Research Institute Codivilla-Putti-Rizzoli, Orthopedic Institute, via di Barbiano 1/10, 40136 Bologna, Italy, Department of Reproduction and Aging, University of Pisa, Pisa, Italy, Department of Internal Medicine, University of Pisa, Pisa, Italy, igea SRL, Carpi, Modena, Italy) states: “Newer concepts on osteoarthritis (OA) pathogenesis are related to the role of inflammation that is now well accepted as a feature in OA. Synovitis is common in advanced age involving infiltration of activated B cells and T lymphocytes and the expression of pro-inflammatory cytokines and chemokines is observed in patients with OA in the joints of OA patients and animals. With regards to this, IL-1, TNFæ, IL-6, IL-18, IL-17 and leukemia inhibitory factor (LIF) appear to be more relevant to the disease. These catabolic cytokines lead to the destruction of joint tissue by stimulating cartilage PG resorption, MMP synthesis and nitric oxide production. The purine base adenosine has been shown to limit inflammation through receptor (i.e. A2a)-mediated regulation and suppressing pro-inflammatory cytokines synthesis (TNFæ, IL-8, IL-2, IL-6). Adenosine has been reported to reduce inflammation and swelling in several in vivo models of inflammation and also in adjuvant-induced and septic arthritis in animals. So, a therapy combining an anabolic effect on chondrocytes, a catabolic cytokine blockage, a stimulatory effect on anabolic cytokine production and one that is able to counteract the inflammatory process would be extremely useful for OA treatment. In vitro studies showed that chondrocyte proliferation and matrix synthesis are significantly enhanced by PEMF stimulation, when investigating also the conditions affecting the PEMF action. A part the importance of physical properties of the fields used (intensity, frequency, impulse amplitude, etc.) and the exposure time, the availability of growth factors, environmental constrictions and the maintenance of the native-cell matrix interactions seem to be fundamental in driving the PEMF-induced stimulation. In particular, the interaction between cell membrane receptors and mitogens seems to be one of the molecular events affected by PEMFs. These data are in agreement with results of in vivo studies with a decalcified bone matrixinduced endochondral ossification model and showing that the stimulation of TGF-1 may be a mechanism through which PEMFs affect complex tissue behavior and through which the effects of PEMFs may be amplified. In addition, PEMFs are reported to up-regulate mRNA levels for, and protein synthesis of, growth factors resulting in the synthesis of ECM proteins and acceleration of tissue repair. As far as inflammation is concerned, IL-1 is present in high amounts in OA cartilage and is considered to be one of the main catabolic factors involved in the cartilage matrix degradation associated with OA. As previously mentioned, PEMFs in vitro were able to counterbalance efficiently the cartilage degradation induced by the catabolic cytokine”. As cited above, many studies lead to the conclusion that PEMF therapy is effective and reduces inflammation. In a study on Chronic Fatigue Syndrome and Electro-medicine, Thomas Valone, Ph.D, showed that damaged or diseased cells present an abnormally low TMP, about 80% lower than healthy cells. This signifies a greatly reduced metabolism and, in particular, impairment of the electrogenic Na+/ K+ pump activity associated with reduced ATP (Adenosine Tri-Phosphate) production. The Na+/ K+ pump within the membrane forces a ratio of 3Na+ ions out of the cell for every 2K+ ions pumped in for proper metabolism. The sodium-potassium pump uses energy derived from ATP to exchange sodium for potassium ions across the membrane. An impaired Na+/ K+ pump results in edema (cellular water accumulation) and a tendency toward fermentation, a condition known to be favorable toward cancerous activity. French researcher Louis C. Kervran demonstrated that Sodium plus Oxygen plus Energy (ex: magnetic) nuclearly transmutes into Potassium as follows: 11 Na23 + 8 O16 + energy = 19 K39 This nuclear process is accomplished with low heat, in a low rate of thermal decomposition, which is the most important and commonly occurring phenomenon of Nuclear Fusion in Biology. As a result, utilization of oxygen in the cells increases and the body increases production of its own energy supplier (ATP). The organism becomes more stable and efficient; toxins and waste products are more rapidly broken down. The body's natural regulatory mechanisms are reinforced and healing processes accelerated. Free radical proliferation is linked to pathological changes that cause cellular malfunction or mutation (i.e. cancer) as well as protein degradation. Free radicals also play a large role in causing damage to all cells of the body but particularly that of the immune system. According to studies, free radicals also deplete cellular energy by interfering with mitochondrial function and contribute to a shortened life span. Cellular energy generation in the mitochondria is both a key source and a key target of oxidative stress in the cells. Seeking an electron to complete the radical, free radicals cause chain reactions as electrons are ripped from molecules, creating another free radical. Antioxidants such as vitamin A, vitamin E, selenium and coenzyme Q10 supply free electrons and are usually prescribed to provide limited relief in counteracting free radical ravages. However, electronic antioxidants produced by PEMF therapy can also satisfy and terminate free radicals by abundantly supplying the key ingredient usually found only in encapsulated antioxidant supplements the electron (Thomas Valone, Ph.D. on Bioelectromagnetics, 2003). On the biophysical level, as PEMF therapy increases the circulation of electrons across the cell membrane, a parallel phenomenon seems to occur, the acceleration of ATP synthesis and of other aspects of the cellular biochemical anabolism. As electrons are drawn to the inner membrane, they increase the ionic charge inside the cell and, thus, the TMP. In 1976, Nobel Prize winner Dr. Albert Szent-Gyorgi established that structured proteins behave like diodes or rectifiers. A diode passes electricity in only one direction. He proposed that cell membranes can rectify an induced voltage and this rectifying property of cell membranes can cause changes in the ion concentration of the inner and outer surfaces of the cell membrane in such a way as to increase the TMP and effectively stimulate the activity of the Na+/ K+ pump. Cell health is directly affected by the health of the Na+/ K+ pump, which is directly proportional to the TMP. Based on these biophysical principles, an endogenous high voltage EMF potential of sufficient strength will theoretically stimulate the TMP, normal cell metabolism, the sodium pump, ATP production and healing. Electro-medicine appears to connect to and recharge the storage battery of the TMP. Dr. Albert Szent-Gyorgi summarizes: “TMP is proportional to the activity of this pump and thus to the rate of healing.” Furthermore, “increases in the TMP have also been found to increase the uptake of amino acids.” This is important, as increasing the supply of nutrients is also an effective aid to cell repair. This is particularly true in trauma where circulation has been impaired by crushed or severed blood vessels, or by the inflammation and swelling that compresses capillaries, blocking the flow to both the injured and uninjured cells. Many studies have demonstrated the positive effects of PEMF therapy on patients with pain, even as opposed to receiving traditional treatment as well as against a placebo group getting no treatment. Some studies focused on the rapid, short-term relief while others demonstrate the long-term effects. The effectiveness of PEMF therapy has been demonstrated in a wide variety of painful conditions. In a study entitled: ”Double-blind, placebo-controlled study on the treatment of migraine with PEMF”, Sherman et al. (Orthopedic Surgery Service, Madigan Army Medical Center, Tacoma, WA, USA) evaluated 42 subjects who met the International Headache Society's criteria. During the first month of follow-up with exposure to PEMF, 73% of those receiving actual exposure, reported decreased headaches with 45% a substantial decrease and 14% an excellent decrease. Ten of the 22 subjects who had received actual exposure received two additional weeks of actual exposure, after their initial month. All showed decreased headache activity with 50% a substantial decrease and 38% an excellent decrease. Sherman R. et.al concluded that exposure to PEMF for at least 3 weeks is an effective, short-term intervention for migraine. Jorgensen et al. (1994 International Pain Research Institute, Los Angeles, CA, USA) studied the effects of PEMF on tissue trauma and concluded: “Unusually effective and long-lasting relief of pelvic pain of gynecological origin has been obtained consistently by short exposures of affected areas to the application of a magnetic induction device. Treatments are short, fasting-acting, economical, and in many instances have obviated surgery”. Patients with typical cases such as dysmenorrhoea, endometriosis, ruptured ovarian cyst, acute lower urinary tract infection, post-operative haematoma, and persistent dyspareunia who had not received analgesic medication were treated with pulsed magnetic field treatment and evaluated. The results showed that 90% of the patients experienced marked, even dramatic relief, while 10% reported less than complete pain. Hedén P., Pilla AA. (2008 Department of Plastic Surgery, Stockholm, Sweden) studied the Effects of pulsed electro-magnetic fields on postoperative pain in breast augmentation patients. She notes: “Postoperative pain may be experienced after breast augmentation surgery despite advances in surgical techniques, which minimize trauma. The use of pharmacological analgesics and narcotics may have undesirable side effects that can add to patient morbidity”. This study was undertaken to determine if PEMF could provide pain control after breast augmentation. Postoperative pain data were obtained and showed that pain had decreased in the treated patient group by nearly a factor of three times that for the control group. Patient use of postoperative pain medication correspondingly also decreased nearly three times faster in the active versus the sham groups. Hedén P and Pilla AA concluded: “Pulsed electro-magnetic field therapy, adjunctive to standard of care, can provide pain control with a noninvasive modality and reduce morbidity due to pain medication after breast augmentation surgery”. The Clinical Rheumatology Journal, volume 26-1, January 2007 (Springer London) reported on the Effectiveness of PEMF therapy in lateral epicondylitis by Kaan Uzunca, Murat Birtane and Nurettin Ta’tekin (Trakya University Medical Faculty Physical Medicine and Rehabilitation Department, Edirne, Turkey): “We aimed to investigate the efficacy of PEMF in lateral epicondylitis comparing the modality with sham PEMF and local steroid injection”. Patients with lateral epicondylitis were randomly and equally distributed into three groups. One group received PEMF, another sham PEMF, and the third group a corticosteroid + anesthetic agent injection. Pain levels during rest, activity, nighttime, resisted wrist dorsiflexion, and forearm supination were investigated with visual analog scale (VAS). Pain threshold on elbow was determined with an Algometer. All patients were evaluated before treatment, at the third week and the third month. Pain levels were significantly lower in the group treated with the local steroid at the third week but the group treated with PEMF had lower pain during rest, activity and nighttime than the group receiving steroids at the third month. Lau (School of Medicine, Loma University, USA) reported on the application of PEMF therapy to the problems of diabetic retinopathy. Patients were treated over a 6-week period, 76% of the patients had a reduction in the level of numbness and tingling. All patients had a reduction of pain, with 66% reporting that they were totally pain-free. Sanseverino et al. (1999, Universita di Bologna, Italy) studied the therapeutic effects of PEMF on joint diseases, in chronic and acute conditions of more than 3,000 patients over a period of 11 years. Follow-up was pursued as constantly as possible. Pain control, recovery of joint mobility and maintenance of the improved conditions represented the parameters for judging the results as good or poor. The chi-square test was applied in order to evaluate the probability that the results are not casual. A general average value of 78.8% of good results and 21.2% of poor results was obtained. The high percentage of good results obtained and the absolute absence of both negative results and undesired side-effects led to the conclusion that PEMF treatment is an excellent physical therapy in cases of joint diseases. A hypothesis is advanced that external magnetic fields influence transmembrane ionic activity. In a 2008 randomized clinical trial to determine if a physics-based combination of simultaneous static and time-varying dynamic magnetic field stimulation to the wrist can reduce subjective neuropathic pain and influence objective electrophysiologic parameters of patients with carpal tunnel syndrome, Weintraub et al. report: ”PEMF exposure in refractory carpal tunnel syndrome provides statistically significant short- and long-term pain reduction and mild improvement in objective neuronal functions”. In a 2009 evidence-based analysis on the use of PEMF therapy in clinical plastic surgery, Strauch et al. (Einstein College of Medicine, Bronx, NY, USA) explain: “Our objective was to review the major scientific breakthroughs and current understanding of the mechanism of action of PEMF therapy”. The results show that PEMF therapy has been used successfully in the management of postsurgical pain and edema, the treatment of chronic wounds, and in facilitating vasodilation and angiogenesis … with no known side effects for the adjunctive, noninvasive, non-pharmacologic management of postoperative pain and edema … Given the recent rapid advances in development of PEMF devices what has been of most significance to the plastic surgeon is the laboratory and clinical confirmation of decreased pain and swelling following injury or surgery”. Because of the interaction between the biological systems and natural magnetic fields, PEMFs can affect pain perception in many different ways. PEMF therapy has shown to be effective at reducing pain both in the short-term and in the long-term. The ways by which PEMF therapy relieves pain include pain blocking, decreased inflammation, increased cellular flexibility, increased blood and fluids circulation, and increased tissue oxygenation. The trans-membrane potential, (“TMP”) is the voltage difference (or electrical potential difference) between the interior and exterior of a cell. An electrochemical gradient results from a spatial variation of both an electrical potential and a chemical concentration across a membrane. Both components are often due to ion gradients, particularly proton gradients, and the result is a type of potential energy available for cellular metabolism. This can be calculated as a thermodynamic measure, an electrochemical potential that combines the concepts of energy stored in the form of chemical potential, which accounts for an ion's concentration gradient across a cellular membrane, and electrostatics, which accounts for an ion's tendency to move relative to the TMP. Differences in concentration of ions on opposite sides of a cellular membrane produce the TMP. The largest contributions usually come from sodium (Na+) and chloride (Cl) ions which have high concentrations in the extracellular region, and potassium (K+) ions, which along with large protein anions have high concentrations in the intracellular region. 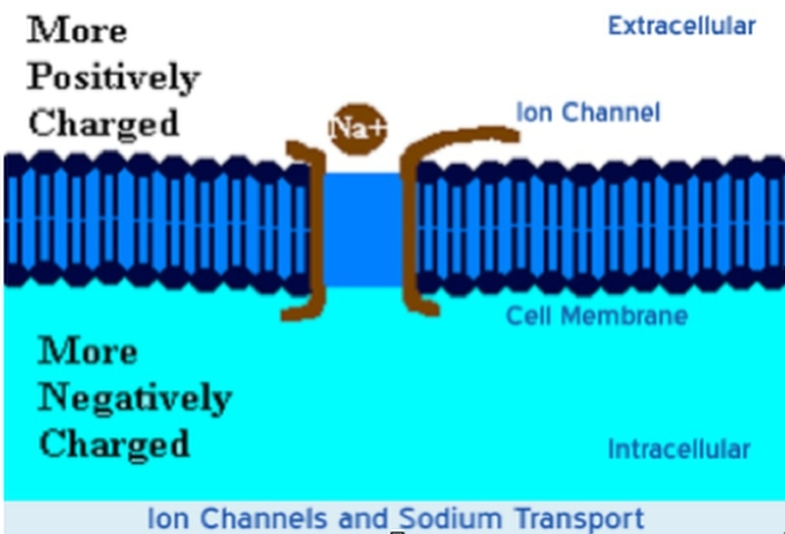 Opening or closing of ion channels for ion transport (Na+, Ca2+, K+, Cl-) in and out of cells at one point in the membrane produces a local change in the TMP, which causes an electric current to flow rapidly to other points in the membrane that occurs with the movement of electrons. In electrically excitable cells such as neurons, the TMP is used for transmitting signals from one part of a cell to another. In non-excitable cells, and in excitable cells in their baseline states, the TMP is held at a relatively stable value, called the resting potential. For neurons, typical values of the resting potential range from -70 to -80 mV (mill Volts); that is, the interior of a cell has a negative baseline voltage. Each axon has its characteristic resting potential voltage and in each case the inside is negative relative to the outside. Opening and closing of ion channels can induce a departure from the resting potential, called a depolarization if the interior voltage rises (say from -70 mV to -65 mV), or a hyper polarization if the interior voltage becomes more negative (for example, changing from -70 mV to -80 mV). In excitable cells, a sufficiently large depolarization can evoke a short-lasting all-or-nothing event called an action potential, in which the TMP very rapidly undergoes a large change, often reversing its sign. Special types of voltage-dependent ion channels that generate action potentials but remain closed at the resting TMP can be induced to open by a small depolarization. When an action potential begins, the channels that allow crossing of the Na+ ions open up. When the Na+ channels open, the depolarization occurs, the Na+ rushes in because both of the greater concentration of Na+ on the outside and the more positive voltage on the outside of the axon. The flow of positively charged ions into the axon leads the axon to become positively charged relative to the outside. With each positively charged Na+ ion that enters the axon, another positive charge is inside and one fewer negative charge is outside the axon. Thus, together the inside grows increasingly more positive and the relative concentration of Na+ inside the axon relative to outside the axon grows greater. This initial phase of the action potential is called the depolarization phase. Now as the depolarization phase progresses, the status of the two physical forces that have been discussed changes. At the end of the depolarization phase, the voltage of the inside of the axon relative to the outside is positive and the relative concentration of Na+ ions inside the axon is greater than at the beginning of the action potential. The inside of the axon becomes sufficiently positive, about +30 mV as an average value, the Na+ channels close. This closing of the Na+ channels will greatly limit the ability of Na+ ions to enter the axon. In addition to the Na+ channels closing, the potassium (K+) channels open. 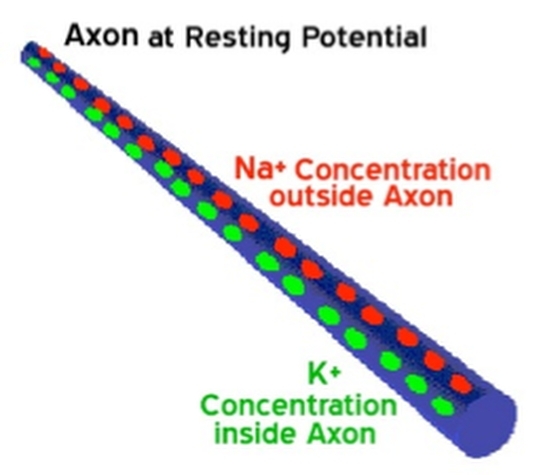 Now K+ ions are free to cross the channels and now leave the axon due both to the greater concentration of K+ on the inside and the reversed voltage levels. The action potential is therefore not the movement of voltage or ions but the flow of these ion channels opening and closing moving down the axon. This movement of the ion channels explains why the action potential is transferred slowly relative to the normal flow of electricity. The normal flow electricity is the flow of electrons in an electrical field and the electrons travel at the speed of light while the movement of these ion channels opening and closing is considerably slower. These are mechanical movements that cannot move as fast as the speed of light. 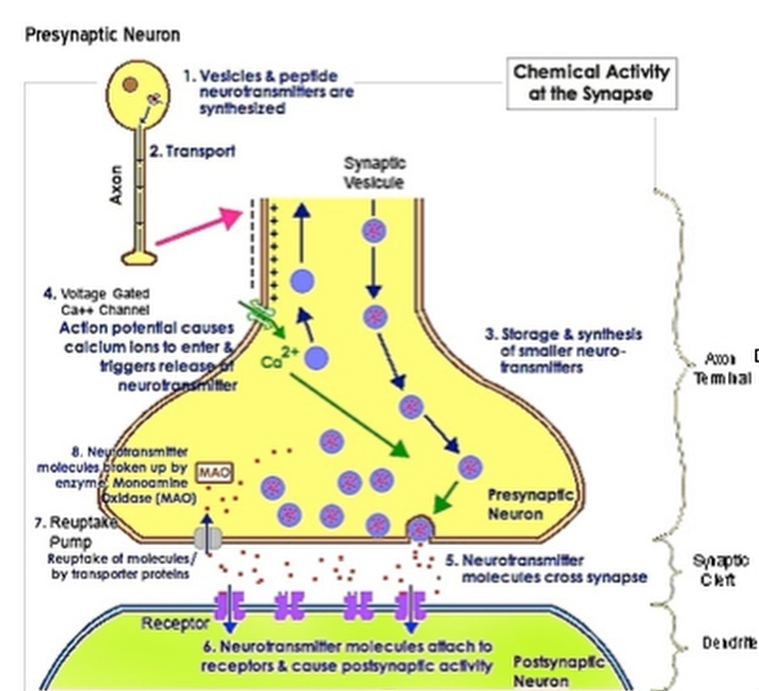 The exchange of the sodium (NA+) and potassium (K+) ions then triggers exocytosis of neurotransmitters via synaptic vesicles. These neurotransmitters diffuse into the synaptic gap. Once this process has occurred, the cell depolarizes back to its previous level of 70mV. Research by Warnke established that the application of PEMF therapy has an effect on the quiescent potential of the neuronal synaptic membrane (Warnke, 1983; Warnke et al. 1997). It suggested that the effect is to lower the potential to a hyperpolarized level of 90mV. When a pain signal is received, the TMP has to be raised again in order to fire an action potential via neurotransmitters but it only achieves to raise the cell TMP to an approximate +10mV. This potential is well below the threshold of +30mV necessary to release the relevant neurotransmitters into the synaptic cleft and the pain signal is effectively blocked. By causing a hyperpolarized state at the neuronal membrane, PEMF therapy effectively blocks pain as it prevents the threshold necessary to transmit the pain signal to be reached. In the same way, PEMF therapy effectively increases the TMP of damaged cells thus allowing them to recover their functions, heal and improve their metabolism. The Encyclopedia of Nursing and Allied Health define the use of “Electrotherapy” for pain relief as effective to manage both acute and chronic pain. In the “Gate Model” of pain, the neural fibers that carry the signal for pain and those that carry the signal for proprioception (body and limb position) are mediated through the same central junction. Because signal transmission along pain fibers is slower than transmission along proprioception fibers, the Gate model suggests that intense stimulation of proprioception fibers can block the slower-moving pain signals. For most individuals, aside from the multiple benefits of the therapy, one of the most relevant effects of PEMF therapy is the improvement of painful conditions regardless of their origin. Pain mechanisms are complex and have peripheral and central nervous system aspects. During the last 100 years, theories of pain mechanism have evolved from specificity and summation models to the popular Gate Control Theory. The latter pain theory, proposed by Melzack/Wall/Casey (Wall and Melzack, 1989) has become the most important development in the field of pain management. Pain perception is no longer a straightforward afferent transmission of pain signal. In biology, signal transduction is a mechanism that converts a mechanical or chemical stimulus to a cell into a specific cellular response. Signal transduction starts with a signal to a receptor, and ends with a change in cell behaviour. Transmembrane receptors move across the cell membrane, with half of the receptor outside the cell and the other half inside the cell. The signal, such as a chemical signal, binds to the outer half of the receptor, which changes its shape and conveys another signal inside the cell. Sometimes there is a long cascade of signals, one after the other. Eventually, the signal creates a change in the cell, either in the DNA of the nucleus or the cytoplasm outside the nucleus. In the chronic pain state, pain signal generation can actually occur in the central nervous system without peripheral noxious stimulation. In pain management, modulation of the pain signal transmission is a far better choice than neural destruction, and this can be achieved with PEMF. Scientific evidence shows that acute persistent pain eventually sensitizes wide dynamic neurons in the dorsal horn of the spinal cord, the wind-up phenomenon, constituting the basis of developing chronic pain syndromes (Kristensen, 1992). Persistent and excessive pain has no biological good or necessary function. It is actually harmful to our well-being. Therefore, pain needs to be treated as early and as completely as possible and not to be left alone (Adams et al. 1997). The primary symptom in most patients with disorders affecting the soft tissue is pain. In many patients, daily activities are limited as inflammation causes pain and, with it, a restriction of the range of movements. Causes of soft tissue pain can be depicted as musculo-skeletal, neurologic, vascular, and referred visceral-somatic or articular (Cailliet, 1991). Early reports of applying electrical current to treat pain date back to before 1800 (Ersek, 1981). PEMF therapy has successfully been used for the control of pain associated with rotator cuff tendinitis, multiple sclerosis, carpal tunnel syndrome, and peri-arthritis (Battisti et al., 1998; Lecaire et al., 1991). An improvement was observed in 93% of patients suffering from carpal tunnel pain and in 83% in cases of rotator cuff tendinitis. PEMF therapy was also used for treatment of migraine, chronic pelvic pain, neck pain, and whiplash injuries (Rosch et al., 2004). In a March, 2003 publication on Pain Management with PEMF Treatment, Dr. William Pawluk explains: “Magnetic fields affect pain perception in many different ways. These actions are both direct and indirect. 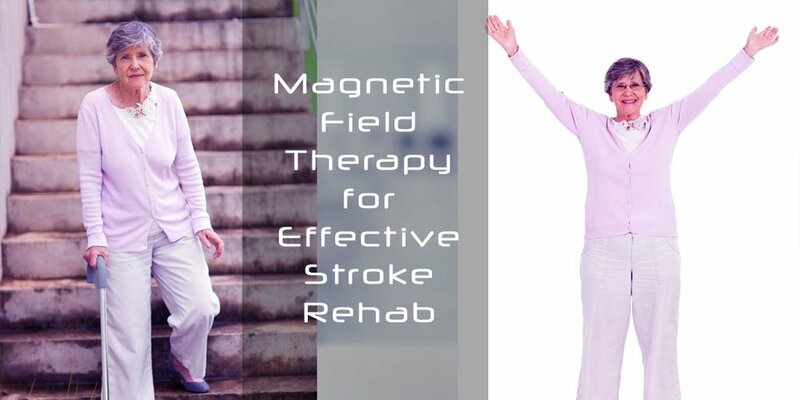 ● Direct effects of magnetic fields are: neuron firing, calcium ion movement, membrane potentials, endorphin levels, nitric oxide, dopamine levels, acupuncture actions and nerve regeneration. Short-term effects are thought due to a decrease in cortisol and noradrenaline, and an increase in serotonin, endorphins and enkephalins. Longer term effects may be due to CNS and/or peripheral nervous system biochemical and neuronal effects in which correction of pain messages occur; and the pain is not just masked as in the case of medication. At the sub-atomic level, as the pulsed fields expand and collapse through a tissue, the protein molecules, such as the cytochromes in the cells' mitochondria, gain electrons and, in doing so, store energy. Even though the instantaneous peak magnetic energy amplitudes are very high, the average magnetic amplitudes generated by PEMF therapy remain low, the average total energy transmitted to the tissues is not powerful enough to create heat within the cells, nor for the cells' atoms to vibrate much and cause a thermal increase, nor for an electron to jump to a higher orbit and emit heat as it returns to its orbit of origin. There is only sufficient average energy for the electron-spin to be increased, thus, energy gets stored in the cells’ mitochondria by converting ADP (Adenosine Di-Phosphate) to ATP molecules more rapidly by the addition of the phosphate radical to the ADP. The ATP molecules store and transport the energy that is then used in the many chemical processes within the cell that participate in all the metabolic functions of living cells. This phenomenon is referred to as the electron transport chain and is described in the diagram below. Supporting the body's internal self-regulating mechanisms by activating cellular and molecular processes. Beyond its complex mechanisms, PEMF therapy offers many health benefits. PEMFs help the natural body healing processes by delivering a non-invasive form of repetitive electrical stimulation that requires no direct contact with the skin surface. Magnetic fields have been shown to affect biologic processes and be effective in a wide range of medical conditions. PEMF therapy has proven beneficial in stimulating cellular metabolism, blood and fluids circulation, tissue regeneration and immune system response. Through these processes, cells are able to function better and tissues repair themselves more efficiently. Through the same processes, vital organs such as the liver, kidneys and colon are able to rid themselves of impurities thus detoxifying the body and allowing better organ functionality. PEMF treatment is effective at increasing bone formation and bone density, healing fractures and osteotomies, recovery from wounds and trauma, graft and post-surgical behavior, recovery from myocardial and brain ischemia (heart attack and stroke), tendonitis, osteoarthritis, and impaired neural function or spasticity from central nervous system diseases such as multiple sclerosis and spinal cord damage. PEMF stimulation offers a safer and more comfortable alternative for urinary incontinence to prior treatments. PEMF therapy improves sports performance, and simply helps to maintain good health. It stimulates muscles, connective tissues, intestines, tendons and cartilage, the brain and peripheral nerve sites. In doing so, PEMF therapy promotes healing and a return to higher activity levels. Functions that were lost begin to recover. Extensive research has been carried out to determine the mechanisms by which this occurs but, for the physiotherapist or other medical professional presented with a wide range of clinical problems, PEMF therapy is an invaluable aid to the clinic. PEMF therapy leaves you feeling relaxed, energized, renewed and with a sense of well-being. It is no surprise that the Medical and Research communities have embraced PEMF technology, performing thousands of university double blind studies on its application regarding a myriad of medical issues. The US FDA accepted the use of PEMF devices in the healing of non-union bone fractures in 1979, urinary incontinence and muscle stimulation in 1998, and depression and anxiety in 2006. The National Institute of Health (NIH) provides an online resource for hundreds of thousands of case studies for all types of medical treatments. Specifically, case studies for the application of PEMF technology utilized in treatments may be found at the NIH site called www.PubMed.gov. At this site you may review research abstracts by simply typing into the search bar any medical indication and the word “PEMF” or “Pulsed Electro-Magnetic Field”. All the studies found on www.Pubmed.gov use low-powered PEMF devices.